This little diddy has been making the rounds of my Facebook friends, and since I have blogged on Sr. Cristoforo Colombo de Zena before (and then a little later), I figured I would throw my two cents in. For my money, Columbus was a man of his age and nothing more. He was a gigantic ball of ego in a world that was rapidly being changed. His fame was due more to the changes in the world around him than anything else. Movable type printing presses, invented in 1439 in Germany, had spread throughout Europe. The Hundred Years’ War ended in 1453, settling a dispute between England and France that had raged throughout Western Europe and required tremendous financial investments. With the war over, financiers could afford to help the crowns of Europe with other expenditures – like expeditions to Asia. Constantinople fell in 1453, leaving a giant gaping hole in the trade with Asia but also freeing the resources of the Italian city states – Genoa, Pisa, Venice – for other activities. The stabilization of Portugal under Juan II, beginning in 1481, presented a threat to the reign of Ferdinand and Isabella, the joint monarchs of Aragon and Castille. The united House of Aragon and Castille had finally succeeded in expelling the Muslims from Iberia (Spain) in 1492. The confluence of these major events in the years prior to Columbus’ expedition created the environment in which he worked. His was not a scientific expedition to prove the world was round (that was a completely unfounded legend created by the American writer Washington Irving in 1821). It was a commercial enterprise, and it was required to make a profit for the Crowns of Aragon and Castille. Too many modern liberals are quick to condemn Columbus. There is certainly a lot we could say about the way he conducted his exploitations, but I doubt seriously that if our places were swapped with his, we would have done much different. The air of superiority that our modern liberals take can be irritating – not because they are necessarily wrong in their assessment of the morality of our successors but because they think they would have thought or acted differently. Columbus was a nice guy compared to Pizarro. Now, there’s a schmuck. Columbus brought the best of Western civilization to a world that was not under strict oligarchic control. Did that cause a lot of innocent people to die? Indeed. And that is not good at all. It is inexcusable. On the other hand, if he – and those who followed – had not brought Western civ to North America, it is very likely that the principles that created the United States would never have been able to gain sufficient ground to establish a nation. If those principles had caught on in Europe, it would have been easy for a well-established oligarchy to smash something like the Continental Congress via force or infiltrate and destroy it from within before the sentiments set down in the Declaration or Constitutution were even on a parchment. Now that the principles upon which the nation was founded are almost nothing but a quaint memory, it is hard to feel like it was all worth it…but I can’t merely condemn Columbus either. There are many, many historical situations where a person or group did something terrible – but some of the things that were able to happen after that were not terrible. We can’t oversimplify without losing something. I agree. 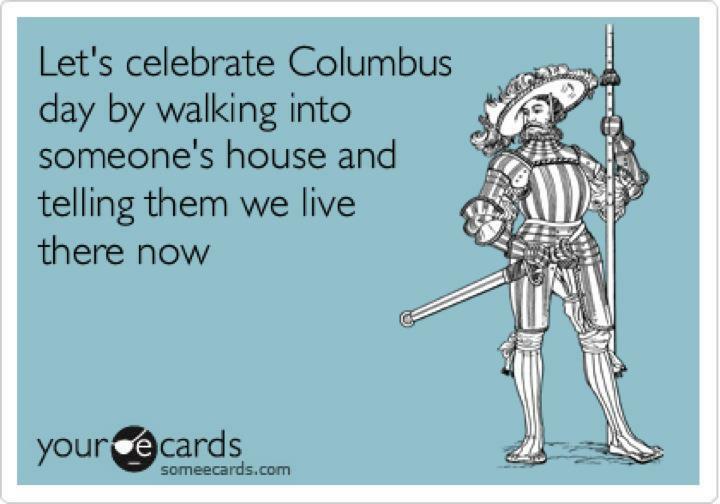 It is difficult to condemn what Columbus did since he was very much a product of his age. What followed was unprecedented, largely because once nonconformists figured out just how big the Americas are and just how far away Europe is, they started to hitch rides with the establishment’s settlers and do their own thing. In North America, the nonconformists eventually did break free – in South America, not so much.